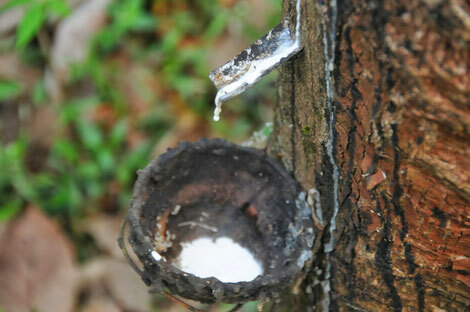 Natural rubber is produced by the rubber tree (Hevea brasiliensis). In order to collect the latex milk from tree, an incision is made in the bark of the rubber tree – which is called ‘tapping’. Depending on the use, following the tapping stage the latex milk is processed in different ways. About 70 per cent of natural latex is used for tires. Other products made of natural rubber are e.g. mattresses, condoms, shoe soles, hot water bottles, balloons, rubber boots and seal rings. Natural rubber can be substituted by synthetic rubber for some applications. Synthetic rubber is made from petroleum (i.e. fossil fuel). In many products - such as car tires - natural as well as synthetic rubber is used. More detailed information about rubber, you can find here or in this study by Aidenvironemt. The production of natural rubber can be characterized with ecological and in some cases severe social problems. Low world market prices for natural rubber make it more and more difficult for latex producers to make a living from tapping rubber. Furthermore, studies document cases of extremely poor working conditions. Typical problems include inadequate safety standards, inappropriate use of toxic chemicals, discrimination, excessive working hours and child labour. Agrochemicals used in the production of natural rubber are less controversial with regard to any residue in the final rubber products. Far more important is that their use threatens the health and wellbeing of the people involved in the production and processing of the natural rubber. More information about sustainability problems and solutions in the rubber sector, you can find here. According to data from the International Rubber Study Group, in 2015 about 12 million tonnes of natural rubber have been produced. World production has nearly doubled since 2000. Due to good climatic conditions and, for a long stretch of time, availability of land, about 80% of the global rubber production originates from Asia. According to a 2015 study by Accenture, the biggest producers in 2013 were Thailand (34%), Indonesia (26%), Vietnam (8%), China (7%), India (7%) and Malaysia (7%). The same study documents that the biggest importers of rubber in 2013 were China (37%), the EU (10%), the USA (8%), India (8%) and Japan (7%). The main reason for this is that most tires are produced in China. More details about global latex production, you can find here. Fairly produced rubber has only a tiny market share. Since 2012 just a little over 600 tonnes of dry rubber content have been traded according to the criteria of the Fair Rubber Association. Because of this, more than 300.000 € of Fair Trade premiums could be passed on to our producer partners and have been used there for a wide range of different Fair Trade projects.